A domestic version of this product is also available for $1,424.05. 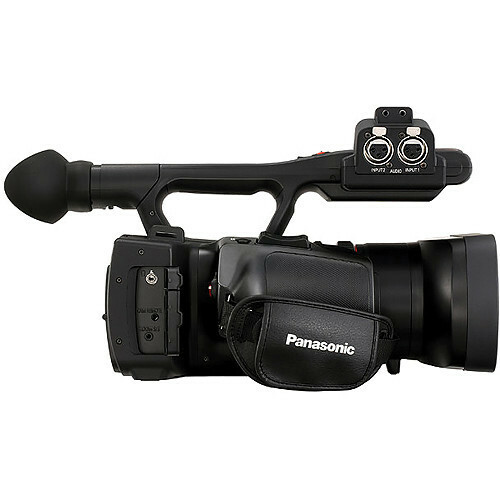 The Panasonic AG-AC90A AVCCAM Handheld Camcorder features three 1/4.7" sized MOS sensors (3MOS), with 2.19MP each, to capture Full HD 1920x1080 resolution video at up to 60p. 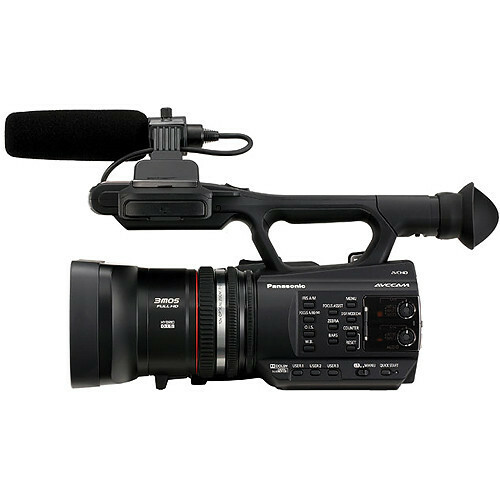 It is an update to the AG-AC90A, offering additional 720p60 and 480i/60 3.5Mbps recording modes, as well as other enhancements such as the ability to copy content from one SD card to another in-camera. Features inherited from the AG-AC90 include the 12x zoom lens with a 35mm equivalent focal range of 29.8 to 357.6mm, Nano Surface Coating for reduced ghosting and lens flares, and three manual control rings for focus, zoom, and iris. 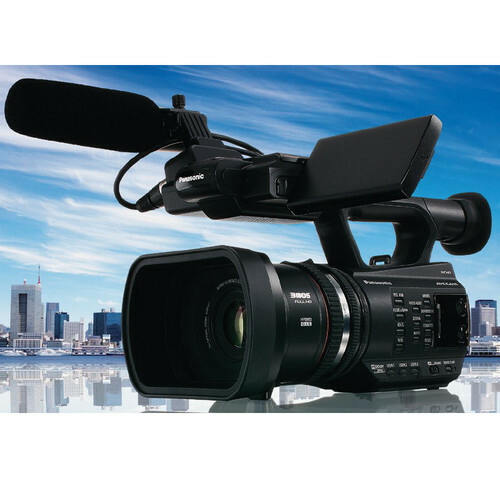 The AG-AC90A records Full HD 1920x1080 video in a variety of frame rates using the AVCHD codec, including 60p, 60i, 30p, and 24p. A 1280x720 60p mode is available for lower resolution files with smooth motion, ideal suited for sports recording and coaching applications. You can also record SD video, including a low 3.5Mbps bit-rate mode for easy uploading to cloud servers. Date and time stamps can be super-imposed over the video, a feature useful for law enforcement and legal depositions. Two SD memory card slots are available for expanded memory or simultaneous recording to both cards for an instant back-up. 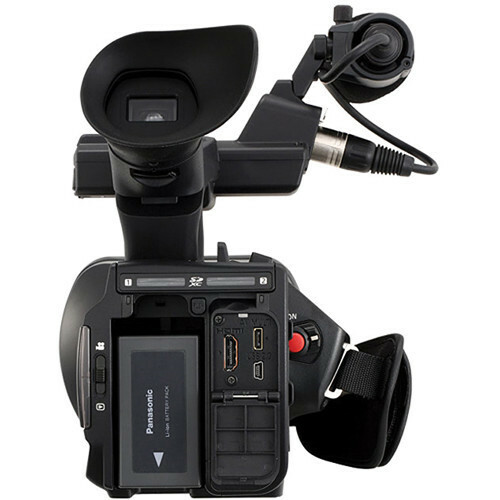 The camcorder is compatible with SD, SDHC, and SDXC card up to 64GB, with support for ultra high-speed UHS-I speed class 1. It is also compatible with optional Eye-Fi SD cards for Wi-Fi transfer to your mobile device A five-axis image stabilizer improves stabilization for handheld shooting, and 4x pixel shifting technology helps to create a sharper image. An Intelligent 25x digital zoom function makes automatic adjustments of edge, gradation, and detail. In addition to a built-in microphone, two XLR audio inputs provide an interface for professional grade, external microphones. Audio Channel 1 and Channel 2 feature individual level controls and input selection, including 48V phantom power supply on/off. Three 1/4.7" sized MOS sensors - a configuration Panasonic calls 3MOS - featuring 2.19MP each. These sensors capture native Full HD 1920 x 1080 resolution video. The camera's fixed lens features up to f/1.5 brightness and produces an angle-of-view equal to 29.8-357.6mm on 35mm format. Nano Surface lens coating reduces ghosting and flare, and three manual control rings facilitate adjustments for focus, zoom and iris. The AG-AC90A can record 1920x1080 resolution at 60p, 60i, 30p and 24p; in addition to standard 1280x720 60p and SD 480/60i. Two media card slots accept SD memory cards for expanded memory or simultaneous recording to both cards for an instant back-up. The AG-AC90A is compatible with Sd, SDHC, and SDXC cards, with support for ultra high-speed UHS-I Speed Class 1 cards. Five-Axis optical image stabilization makes for smoother handheld videos, and pixel shifting helps to create a sharper image. An intelligent digital zoom achieves up to 25x seamless zooming. The digital zoom function is also available in 2, 5, and 10x zoom. 3MP still photographs can also be captured during video recording. Interval Recording captures one frame at a time in set intervals (1 sec, 10 sec, 30 sec, 1 min, 2 min). Pre Record prevents missed opportunities by storing about 3 seconds of video and audio data in temporary memory prior to pressing the Rec button. Record Check lets you check the end of the most recently recorded clip with one-touch ease, and Last Clip Delete provides one-touch delete of the most recently recorded clip. In addition to a built-in 5.1-channel surround sound mic, the AG-AC90A features 2-channel XLR audio input terminals for external mic use. Input (Mic/Line) can be selected for CH1/CH2 independently, and a 48 V phantom power supply (ON/OFF) and level control are provided. An HDMI output supports digital output of video and audio signals to a wide variety of HD devices. Other connections include an AV Multi output for analog video and audio, an analog component video (component terminal), analog composite video (pin jack), and analog audio (L/R pin jacks) through the bundled cable. USB 2.0 connectivity aids users in transferring files to a PC, and remote terminals enable remote operation of iris, focus, zoom and Rec Start/Stop functions. The Focus Assist (Focus in Red) button shows when your subject is in focus by outlining subject edges in red on the LCD monitor. Push AF activates the AF function while in Manual mode with the press of a button (allocated to an User button). This provides handy support for manual focusing. Six scene settings allow for immediate response to a variety of shooting situation. DRS (Dynamic Range Stretcher): Suppresses blocked shadows and blown highlights by visually expanding the dynamic range. This function can be assigned to the user button.